What Are Interesting Facts About Peacocks? 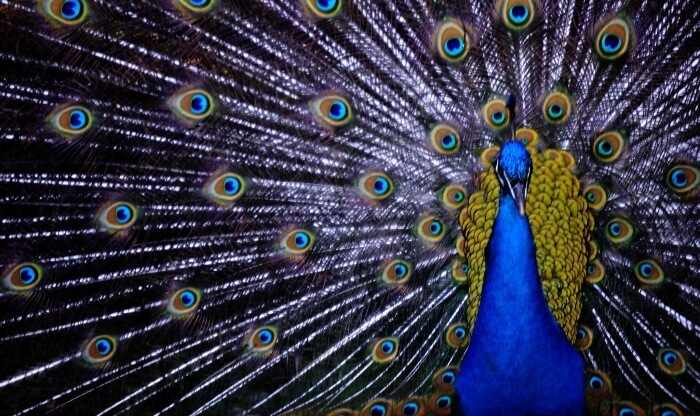 The term ‘peacock’ actually only refers to the colorful male variant of the species while peahen refers to the female that are generally smaller and grey or brown in color. The name peafowl refers to either one. Baby peafowl are called peachicks! A group of peacocks are called a ‘party’ while a group of peahens is referred to as a ‘harem’. The amazing eye-spotted tail feathers on a male peacock can stretch nearly 2 meters (or over six feet in length) and can account for 60% of the bird’s total body length. Despite the long tail feathers on peacocks, they can actually fly… just not very far. Peafowl can live to be over 20 years old! Peafowl are one of the loudest birds and have 11 distinct calls that can travel great distances. The peacock is indigenous to central Africa, Southeast Asia, Sir Lanka, Pakistan and India, where it lives in forests and rainforests. Peacocks live on a diet of insects, grains, berries, leaves, seeds, figs and small mammals and reptiles, even lizards! Depending on the species, the peacock can grow to be up to 51 inches long, although some are as small as 27 inches long.